You are the head coach of a new created soccer club and you have to carry your team to victory. As the game progresses you will face the complexity of making the best decisions and strategy for your squad. However, keep in mind this is a sports strategy game and the road is not easy, every match and encounter during your campaign as the manager will be a challenge. At its core, the game lets you build a team from scratch, making decisions, developing your squad, improving soccer players and managing resources or infrastructures. In other words, the Universe of Soccer Legends creates a unique and exclusive experience to every player. Turn-based match: like board games, in Soccer Legends is essential to keep in mind your moves and selecting carefully your actions. Strategy: adapt yourself to events that can influence the match, like the injuries, moral of players, public, referee or weather. Everything can disrupt your plans. RPG Components: earn experience and improve your player’s abilities with more than 50 different special techniques. Soccer Manager: drive your squad to glory, handling everything from the financial resources, to sponsors, staff, infrastructures and contracts. Build your dream team from scratch. Anime feeling: Soccer Legends delivers incredible action sequences in a unique style that resembles some of the most popular anime series. Unique database: each match is unique, with different players or teams, infinite possibilities. Complex AI: every opponent will have different reaction and behaviour, based on their own skills and strategies, making the road to victory a challenge. WHY SOCCER LEGENDS IS SPECIAL? Soccer Legends puts the fate of the entire club in your hands. You'll be able to manage things like tactics and trades to keep your squad fit. Balancing the payment wages and other fees is indispensable, bankrupt the club and you'll find a "game over" screen. Your success will take you to different teams throughout career mode, to build a team of legends. On the field, you will have to move your soccer players and make use of over 50 skills to score goals. Some abilities are evident and basic like shooting and dribbling, but keep in mind that in order to win, you need to obtain other techniques in manager mode. Some skills can improve a player's strength, deny an opponent's ability and change the weather or crowd mood in the game, which like in real-life soccer is a huge impact. The Steam Early Access for Soccer Legends will launch at midnight on the 5th of August for our American friends, which is 9 AM for our European soccer experts. You can get the game at a discount during the launch week, which is on top of the already lowered Early Access price, more on that below. What is included in the Early Access build? For Soccer Legends the early access period is essential for the process of developing the game. A good soccer game has excellent balance and Early Access is an ideal way to let the community help with that. PHASE ONE: Tactical RPG gameplay with the match module. The first module that will be released during the Early Access is the match module. Players can engage in tactical turn-based matches again CPU teams. During phase one the game will be on sale for €12,99. PHASE TWO: Tactical RPG gameplay with deep team management tools. So what’s better than playing deep turn based matches? Well, an added management system for your favourite team of course! Once the phase two features are added Soccer Legends will be on sale for €24,99 to reflect the added features. PHASE THREE: Full on polish mode. They say that the devils are in the details. ‘They’ are of course right, so after the implementation of the management systems, the remaining time will be used to polish the game to a mirror-like sheen. Once Soccer Legends is completely finished the game will be on sale for €29,99, which always was the intended price for the game. Soccer Legends, what is that? Soccer Legends brings the excitement of Tactical-RPG games to the world of football. Managing a team, controlling it in the spectacular turn-based matches where taking the initiative and selecting the best strategy is the only way to glory. 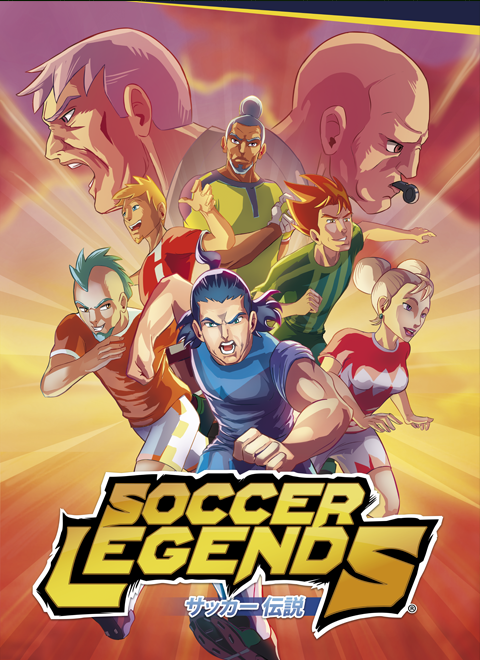 Soccer Legends takes the best facets of board games and blends with gorgeous animation sequences with the soul of 90’s anime series, offering something truly new. At its core, players can build the team from the scratch, taking decisions, forming the squad, managing resources and buildings, improving squad members… In a few words, allowing it to get a single game experience for each player.